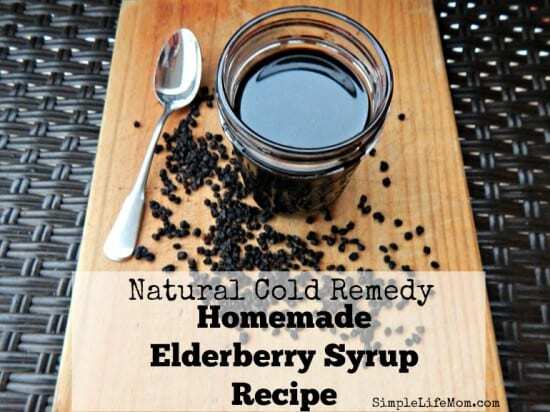 This Natural Cold Remedy: Homemade Elderberry Syrup Recipe is a time tested remedy and well loved for a reason. 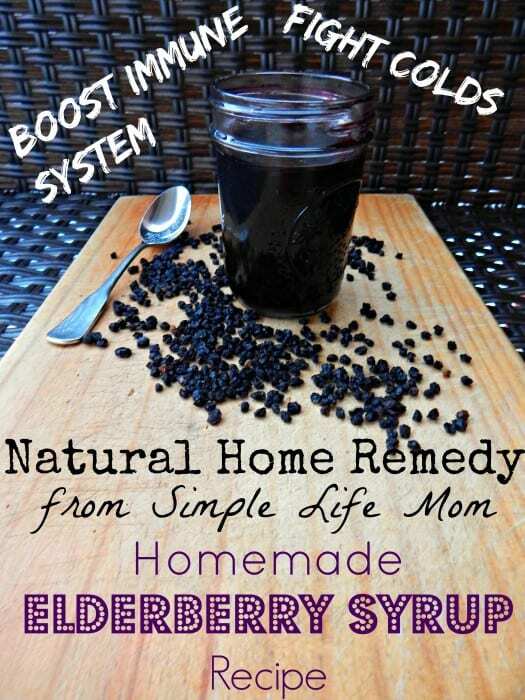 don’t realize how completely EASY and FRUGAL it is to make your own elderberry syrup (and it tastes really good!!). 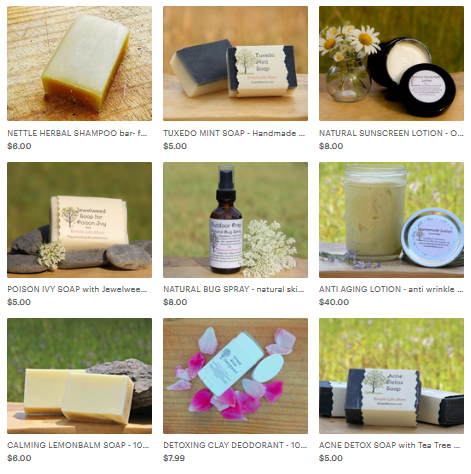 It costs on average $15 for you to buy an 8oz bottle that is already made for you. I bought a 1 pound bag of dried elderberries on Amazon for under $17, made a large batch, and still have enough elderberries to make one more batch at least! Elderberries are being sold out everywhere right now because it is winter. People know about and believe in this remedy. Amazon still has some: HERE. I’m guessing more places will be in stock again by the beginning of February. Elderberries (sambucus) have been used traditionally to fight off cold and flu symptoms by boosting your immune system. They have high levels of Vitamins A, B, and C.
We’ve heard of the powerful effects of different types of flavonoids found in blueberries, chocolate, tea and many vegetables. These flavonoids have been shown to boost immune systems and have antiviral activity. Black Elderberries are full of flavonoids, which is why they seem to do such a great job. Combine them with other ingredients that boost your system like cloves, cinnamon, and lemon, and you have yourself a powerhouse of a concoction. To Use: Take 1 tsp daily to boost immune system and help prevent colds. If sick, take up to 1 tsp per hour. (1/2 for small children). You can also eat it over pancakes, in teas, etc. It’s really yummy!! How Long Does it Keep: 2 months or so unopened in the refrigerator (the lemon helps to elongate its shelf life), OR you can can 8oz jars and refrigerate opened jars (This is what I do so that it’s ready when I need it). Ingredients: RAW honey, cinnamon, cloves, and ginger (all fresh if you can do it) all make this a great vitamin and flavonoid boosted syrup. Remove from heat and add lemon and honey, stirring until honey is dissolved. Strain through a cheese cloth, coffee filter, or a cloth and discard berries. OPTION: You can also add 2 Tbsp dried echinacea leaves when you add the cinnamon for an even stronger blend. I’ve never heard of elderberry syrup only elderberry wine! Do you leave the elderberries in the mixture or do you strain it before you pour it into your jar/bottle? Can I use elderberry extract? Thanks! Thanks Shanda, Strain all ingredients through a cheese cloth, coffee filter, or old (clean) t-shirt. I really want to give this a try! Where would I want to look for elderberries other than online? Do natural co-ops etc usually have them? A lot of health food stores have them. You can also find them in the wild in a number of locations. They have a white bloom in the summer, and berries in the Fall. I love the combination of all the ingredients used. We have loads of wild elderberries growing here so I will get some and follow your recipe. Oh, I wish I could say that I had loads of wild elderberries growing around me. I have searched and searched. What part of the country do you live in, if you don’t mind saying? I will sure give this a try,it looks great. Thanks so much for sharing with Full Plate Thursday and have a great week. I am so glad you shared your recipe on the HomeAcre Hop, I am going to have to ry your recipe! As one of the co-hosts of the Hop I am going to feature your post tomorrow! 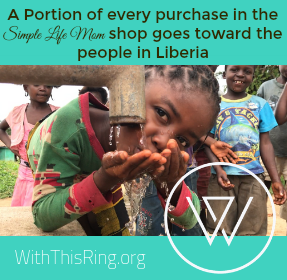 Hope you stop by and share another post tomorrow! Are you able to can this? If so, do you have directions or suggestions? Thank you. Yes, I can it. While it is still hot, pour into 4-8oz jars leaving only 1/4 inch space on top. That’s usually enough for my tops to seal and pop, but you can always place them in a hot water bath for 5-10 minutes if they don’t. Stacie, I also live in SW FL near Desoto Co. Let’s get together sometime and chat. I grew up with elderberries but did nothing with them. Nice to hear you had fun with them! It’s a big help in my family. It’s the first thing I grab when someone starts to get sick. I’m so glad you have your own elderberry bushes! That’s great. Would I be able to leave out the ginger? Would you have a suggestion on what to replace it with? My daughter cannot have ginger. Thanks! Yes, the elderberry is the main ingredient. The others are what I add to give it an extra boost. Do you leave the pot covered or uncovered? Leave it uncovered so that water evaporates and it thickens. I followed the recipe exactly, but it is like water and very tasteless. I was excited to try it, but now it’s just kind of meh. It definitely depends on how much sugar you are used to consuming. Add more honey and cook it down more for a thicker consistency. Hi Kelly! What type of echinacea do you use? My health food store carries 3 different types – purpurea (herb and root) and angustifolia (root). Also, is it safe for my 2 year old if I add the echinacea? Thanks for all you do!! I use the leaf, but for this both is great as well. How many cups of this syrup do you end up getting at the end? I don’t know what I did wrong but when I made this I got about 1 1/2 cups. Please reply I’m very curious & maybe you can also tell me how I can avoid getting just 1 1/2. 3 cups of liquid can very easily cook down to half the amount to make a syrup. If you’d like to make more you can easily double the recipe and add more water if desired. If it’s a thin syrup then make sure you can it properly in 4-8oz jars to preserve it. The less concentrated it is, the faster it will spoil after being opened, but we just open one when we’re coming down with something and keep it in the fridge and use it all over a few days. Yes, medical information that I have found says that freezing does not damage nutrients available from fruits, so that would be a good alternative to canning.